As it seems like I am pretty much every other month these days, I’m up in the air once again entertaining the idea of switching over from cable to FiOS. 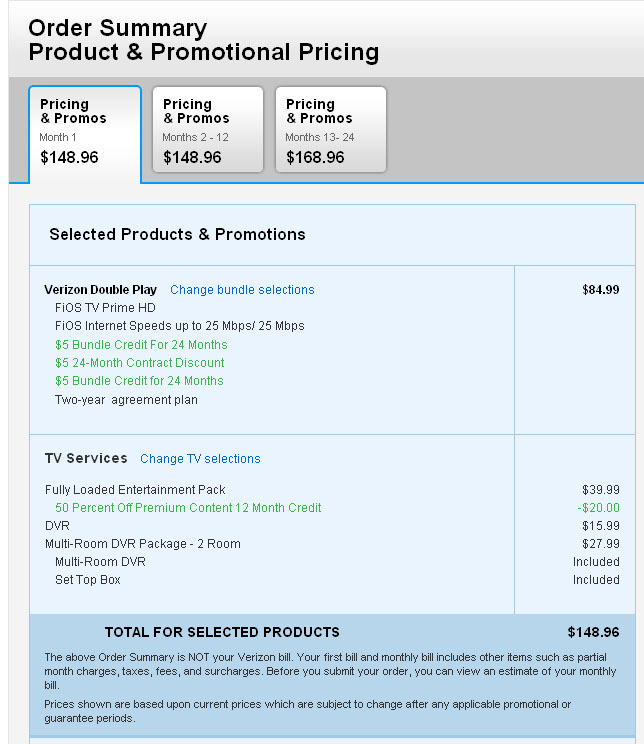 It’s mainly the money that’s got me curious this time – I know that I’ve bitched in the past about promotional pricing being a giant racket, but we’re paying an embarrassingly obscene amount for cable these days … the service arguably hasn’t really even improved (more so worsened, if you ask my wife!) and yet their prices continue to inch up a la inflation like just about everything else except my income, so I guess I’m just at the breaking point where I feel like something’s gotta give! Thankfully, it looks like Verizon finally got it in gear and re-wrote their checkout system to better spell out what to expect of their promotional pricing, so maybe this won’t be so bad after all. Even after trimming off a couple of unneeded channels from our cable package first, the year #2 price for FiOS is still about $10 cheaper than what we’re paying for cable now, and you can see for that first year it’s more in the neighborhood of a $30/month discount, which would be kinda nice! My wife is eager to switch literally tomorrow because she just despises that the on-demand channels never seem to work with cable for her. I myself see it a little more lax because I hardly watch any TV at all right now, although we have been having ongoing issues with our router and I’m pretty sure we get a fancy, new one with FiOS so that might be my incentive to make the switch.